If you are interested in seeing the latest developments at the Apple Park which is currently in the final stages of construction, you are sure to enjoy this 4K Ultra HD drone tour which has been created by Matthew Roberts. Even though construction is still well under way around the main circular structure Apple has started moving employees into the new campus, with everyone expected to be in place by April 2018. Apple Park is estimated to have cost around $427 million for the building alone and an estimate of 5 billion for the complete build which includes landscaping, the land itself, IT infrastructures both inside the building and further afield and additional elements such as the Steve Jobs Theatre which was 85 million. Its circular design and extreme scale have earned a media nickname of ‘the spaceship’. Located on a suburban site totaling 175 acres (71 hectares), it houses more than 12,000 employees in one central four-storied circular building of approximately 2,800,000 square feet (260,000 square meters). Steve Jobs wanted the whole campus to look less like an office park and more like a nature refuge. 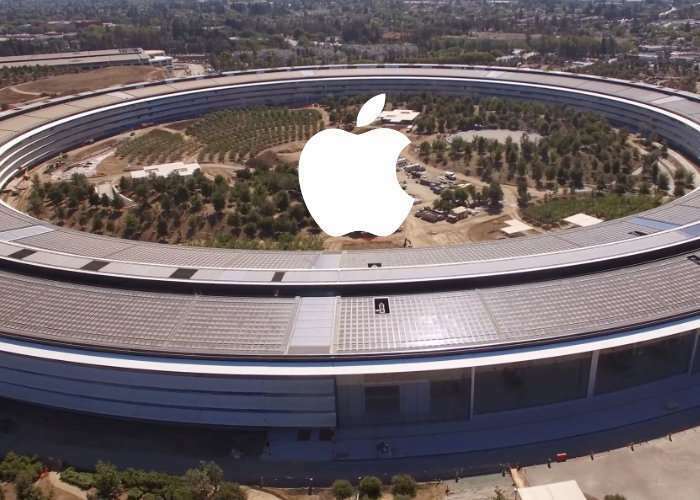 Eighty percent of the site consists of green space planted with drought-resistant trees and plants indigenous to the Cupertino area, and the center courtyard of the main building features a man-made pond.